A DT challenge was issued to create a fall themed card. I decided to use the cat plate and cover the little cat pillow with leaves to make it look like she's sitting on top of a leaf pile. I'm pretty happy with the results! Pink Cat is colored with copics and then her body is flocked and her eyes and nose are covered with diamond glaze to make them shiny. 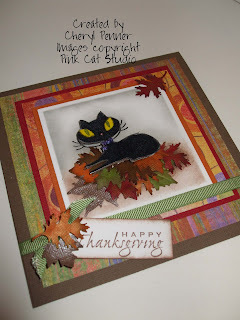 This is my absolute favorite thing to do with these super cute cat stamps from Pink Cat Studio. I originally wanted to have the cat in black to tie in with Fall and Halloween, but she's so dark that you couldn't see her detail, so I changed her to the sable color. She is popped up on pop dots to add even more dimension. The leaves were punched out with punches and then inked and rubbed with a stylus to curl them. I love your card Cheryl! What a great idea to cover the cat bed with leaves! I love the warm & rich feel of your card, fab job!! Great Fall card Cheryl. Love Pink Cat laying on her bed of leaves. How cute! What a great idea to make the pillow look like a pile of leaves! Very creative! Also, a belated welcome to the Pink Cat team! I'm sorry I've been so swamped and didn't have time to welcome you aboard when the announcement was made! I can't wait to see what you create with the new release! Have fun! What a great project! Adding the leaves is a great idea. I love how you colored - I can't seem to get the hang of copics! What a wonderful card Cheryl!! 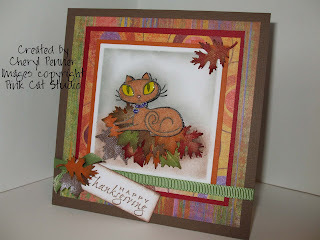 love the kitty in all those leaves what a great idea!